It is a unique and amazing picture... for the man in the gaudy tracksuit is Yorkshire Ripper Peter Sutcliffe. The photo is the only informal snap of Sutcliffe taken since he was locked up in 1981. It shows him relaxed and smiling as he grabs Bruno's giant fist. The source added: "Looking at Peter in this picture, it shows exactly how he is. He is a nice guy with a good nature. He is easy to chat to and could be the bloke standing next to you in the pub. "You would have no idea what his evil past is — and that is perhaps the most chilling thing about him." The meeting took place in 1991 during Bruno's yo-yo ring career. 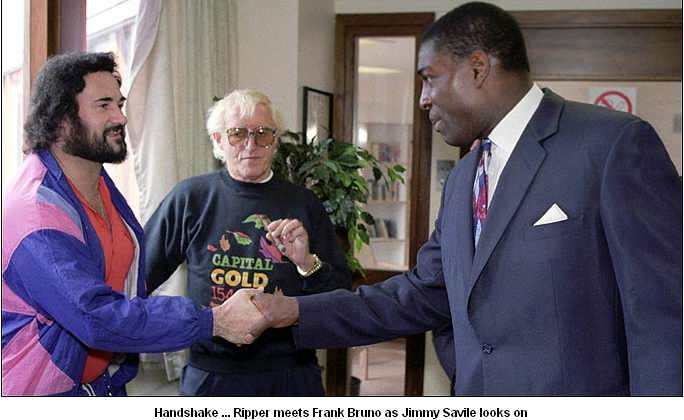 The source said: "It was just incredible seeing Big Frank shaking the Yorkshire Ripper's hand. There are probably more than a few people out there who would rather they met in the ring. "Obviously Frank knew what Peter had done to those women. He was there to do a job and acted very politely. But when he turned round he raised his eyebrows as if to say, 'My God, that was the Yorkshire Ripper'." The Sun revealed last week that the 62-year-old fiend is now considered low risk by Broadmoor's doctors, who have recommended that he be moved to a medium-secure unit. Sutcliffe's lawyers are trying to have him declared sane and are seeking a definite date for his total freedom.